This entry was posted on July 12, 2012 at 1:00 am and is filed under Thursday Tangents. You can follow any responses to this entry through the RSS 2.0 feed. You can leave a response, or trackback from your own site. Please have Alan and Jane discuss “O” Levels and “A” levels, and then at university “first,” “second,” “third!” Always confusing for me! An entertaining and heartwarming post! Now I think the break is mostly: K-5 = elementary school, 6-8 = middle school, 9-12 = high school. But terminology and breaks between schools seem to vary a lot from school district to school district. I know one district here in Tulsa has sixth graders and ninth graders on their own separate campuses, so it’s K-5, 6, 7-8, 9, 10-12. I think this is mostly because they just have so many students. We referred to the high school grades with both names interchangeably; that is, one is equally likely to say one is in ninth grade or a freshman in high school. When I was that age, Kindergarten was a half-day program; you went either in the morning or the afternoon. Now it seems to be a full-day program, I think because more moms are working outside the home and they don’t want to have to pay for half days of daycare. 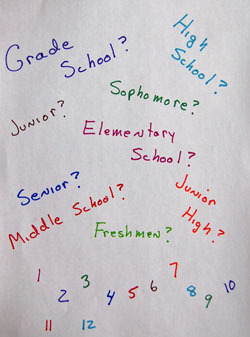 College: Your label as freshman, sophomore, junior, or senior is based on the number of credits you have completed. With many teens now taking advance placement course in high school, many become sophomores during their first year. Those going part time might be at the end of their second year or even at the end of their third year before they are sophomores. Hmm…guessing the terminology in the English system has changed since I was there. When I was sentenced to a year in a London school it was “upper/lower”: “Lower Sixth” was the first year and Upper Sixth” was the second (same for the earlier forms). It does tend to vary a bit from school to school. The commonest system is that forms one to five are usually referred to as the A and B streams (or sometimes even C as well, depending on the numbers). However the sixth form is generally not streamed and its members are referred to as an amorphous lump. First year sixth, lower sixth and even six-one are all synonyms, as are second year sixth, upper sixth and six-two. “Junior high schools were created for the purpose of “bridging the gap between the elementary and the high school,” a concept credited to Charles W. Eliot, president of Harvard University. The faculty is organized into academic departments that operate more or less independently of one another. The middle school movement in the United States saw this model as inadequately addressing the intended purpose of transition by maintaining an emphasis on the high school model, as reflected in the “junior high” designation. “The middle school concept often involves a group of two to eight teachers, depending on the school, from different disciplines working as a team with the same group of students of the same grade level, with each teacher teaching a different subject. This format facilitates interdisciplinary units, where part or all of the entire team teaches on the same general topic from the perspective of different disciplines. The middle school philosophy also advocates assigning students in each team to a homeroom. By having homeroom daily for various discussions and activities, middle schools try to foster a sense of belonging in students to ease social and emotional difficulties during adolescence. In informing Alan, I’m learning a lot myself. One thing that I’ve noticed is that the dates at which school starts vary a lot. Here in NM the kids go back in mid-August. That seems WAY too early… And it must make it tough for families transferring in from places where school starts after Labor Day — in September. By the way, we will get to O Levels and A Levels… It’s just Alan has a few more questions before I get a turn! It seems to me that we used to return to school in maybe late August but probably early September, back in the “old days.” I think the school year got extended at both ends because of so many snow days that had to be made up. These days, year-round warmer weather seems prevalent so maybe we’ll go back to the old calendar. I think that heteromeles has done a good job on explaining the purported rationales, but I think the main difference between districts that have “junior high school” and “middle school” is the available buildings compared to the age distribution of the students. (I’m one of those who never attended kindergarten, grades 1-3 at a public school, grades 4-8 at a parochial (Lutheran) school, grade 9 at a “junior high school”, and grades 10-12 at a “senior high school”. Believe it or not, my post-secondary education was even more messed up!